At least 13 people were killed and scores hospitalized for smoke inhalation in multiple fires in Sonoma, Napa, and Yuba counties. Thousands of homes were destroyed and many wineries were wiped out. The biggest blaze is called the Tubba fire. 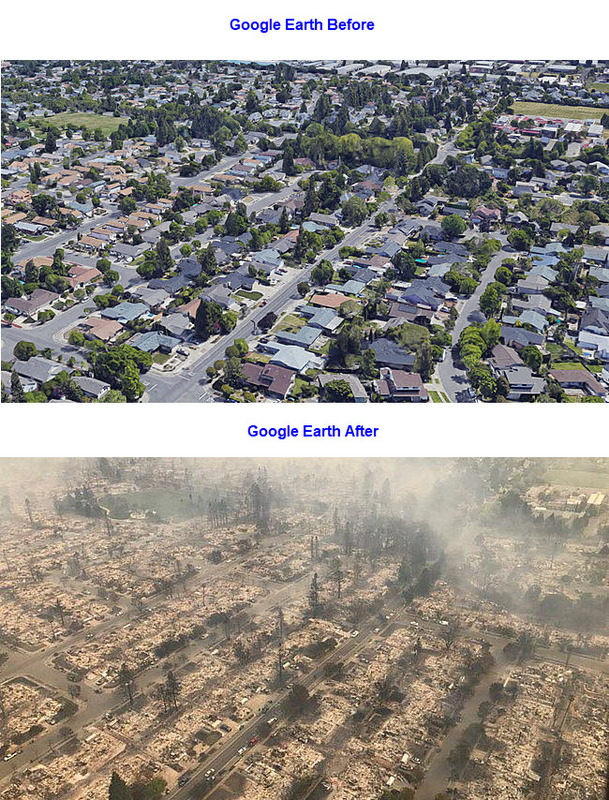 It destroyed 27,000 acres in Sonoma county. There are numerous reports of looting and Governor Jerry Brown declared a state of emergency. 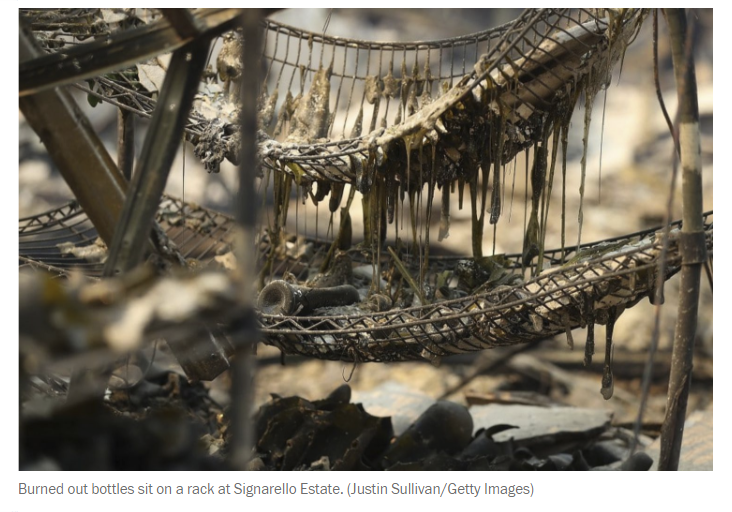 Images show the Widespread Devastation caused by California’s deadly wine-country fires. 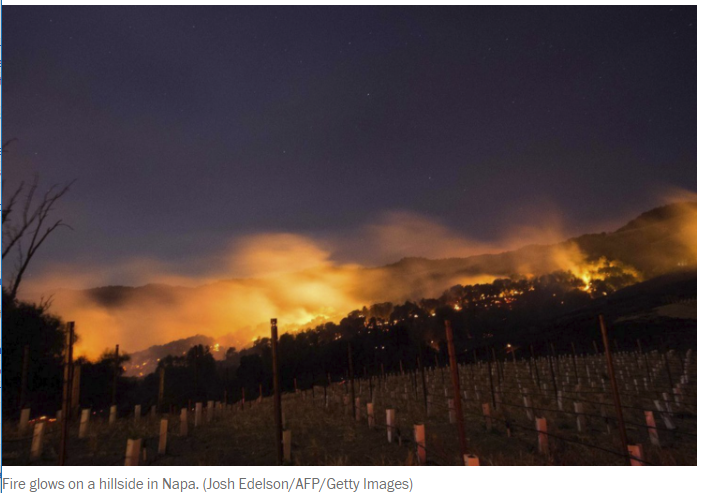 Fast-moving wildfires caused widespread destruction across Northern California’s wine country as flames engulfed multiple counties and raged across more than 100,000 acres, forcing mandatory evacuations and prompting California’s governor to declare a state of emergency. 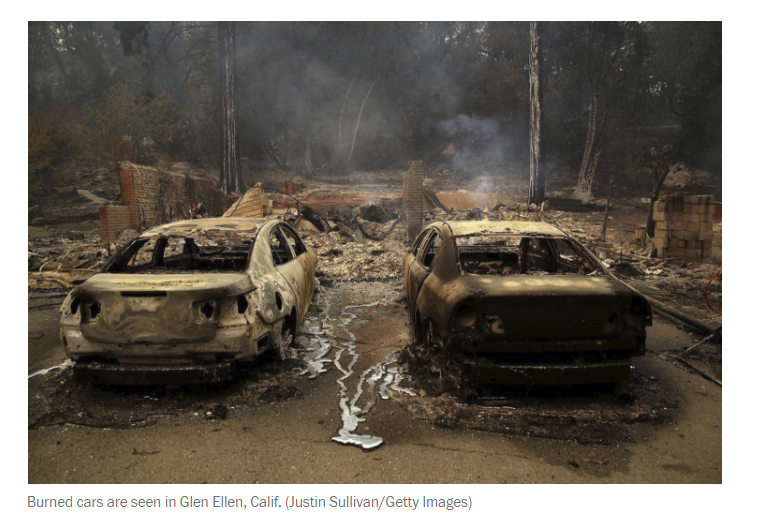 Jonathan Cox, Battalion Chief of the California Department of Forestry and Fire Protection, called the fires “unprecedented” in how quickly they spread. 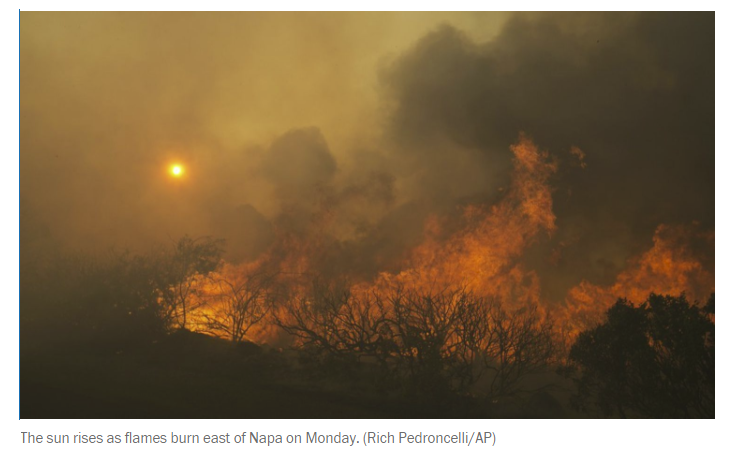 After first igniting late Sunday evening, the fires — at least 17 in all — remained largely uncontained, and may continue spreading because of heat, low humidity and wind, officials said. 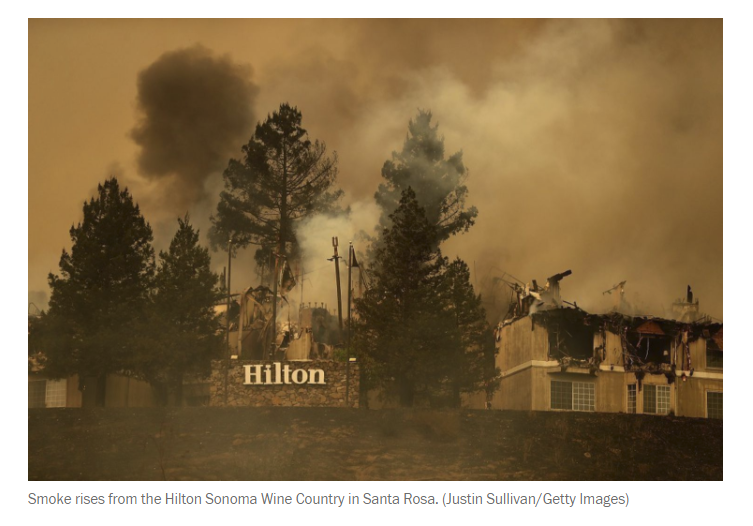 At least 11 people have been killed in the fires, scores of others have been injured or reported missing, and more than 1,500 homes and businesses have been destroyed, officials said Tuesday. Firefighters had “zero percent” containment as of Monday evening, according to a Cal Fire spokesman. Santa Rosa issued a mandatory evacuation of its residents in affected areas at 10 a.m. PT Monday morning after the city manager declared the fires a local emergency. California Gov. Jerry Brown also declared a state emergency as fires continued to rip through northern and southern parts of the state. 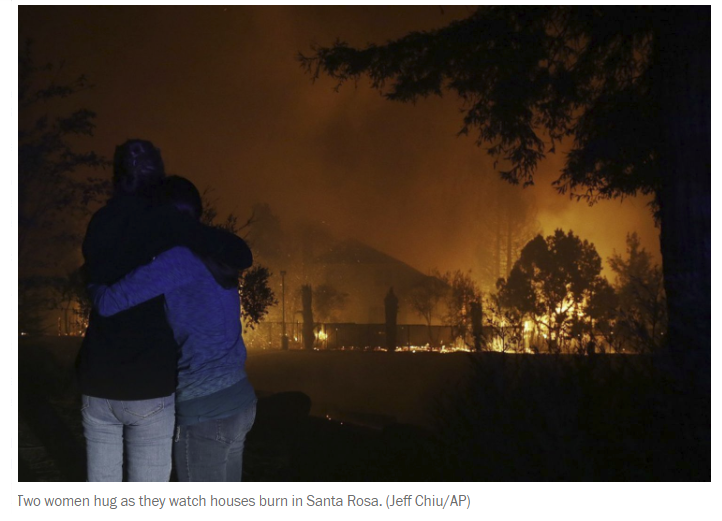 Several neighborhoods in northern Santa Rosa were almost completely burned to the ground including Fountaingrove, according to Cal Fire director Ken Pimlott, who spoke with the Los Angeles Times. AccuWeather reports 13 dead as destructive wildfires strand thousands in California. Buy English Wine as an alternative. Our sparkling Nytimber is very good. Even the French think it’s good! Be compassionate. This is not time to advertise and promote your product in mint of this tragedy. 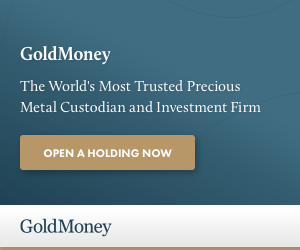 We will pay more for California wine, if we have to rather than buying …. English wine. Not advertising m8! Just extolling the virtues of free trade which all who frequent this site seem to love and know! And whilst I am compassionate for those affected, I also have time for what Medex Man so pertinently says below at 2.38! I told all my wine drinker friends yesterday to go out and “BUY, MORTIMER, BUY!!”. Kinda’ tongue-in-cheek…..but you KNOW the price of wine WILL be going up….maybe for years, depending on the vineyards’ conditions. Earthquakes, hurricanes, fires. Is this the end of days? The earth giving the world economy a little nudge perhaps? Am I the only one wondering why Californians like to build their houses on exposed, shrub covered ridges? Is having a house with a view such a status symbol that knowing it’s only a matter of time before it’s consumed by fire doesn’t matter? It would make so much more sense to have yearly controled burns. This was nature’s way for thousands of years. Enviro-terrorists don’t support mother nature’s solutions. “controlled burns’??? ?Are you crazy? Don’t you know THAT would NOT be the natural way Mother Nature would do it every few years………. Yes, it is a status symbol to build on a hill, surrounded by dried out shrubs. The mistake is not preparing for a fire. All valuables need to be in a “fire proof” safe. Got a basement? Again store stuff there. Have a plan. Have ALL IMPORTANT papers either in a fire proof safe or in a “case” that you grab and go. It must be awful to lose everything and some of these home owners lost EVERYTHING. I’m thinking that a safe for your valuables or a basement wouldn’t have helped THESE people….looking at the pictures of the fire that swept completely over the neighborhood and engulfed EVRYTHING…..a basement would just be a receptacle for the ashes to congregate….. WOW! Thinking you might be ‘safe’ in the middle of a neighborhood – away from grass and the forest…….WOW !! This has been a terrible year for natural disasters. We are praying for all the victims of this year’s fires, floods, hurricanes and earthquakes. People love to live near the water or in/near the forests. Naturally there are risks that go along with those decisions. In California living on soft soils near active earthquake faults presents an even greater danger. But few people investigate these hazards when buying a property. California is way overdue for a 7.0-8.0 earthquake. Only 10% of Californian households have earthquake insurance. The state legislature recently declared California a “sanctuary state” signed into law by Gov. Jerry Clown making it practically impossible for the authorities to deport illegal aliens even if they violate laws over and above Federal immigration statutes. So there will be ample cheap illegal labor to repair the damage meaning bigger profits for the contractors. Just like immigration laws, labor laws in California are ignored. Jerry Clown approved driver’s licenses for illegals so they “had a way to get to work in the morning”. I recall when Obama successfully sued Arizona for passing SB 1070 since the state was said to interfere with Federal immigration enforcement. Yet California interferes with Federal immigration enforcement with impunity. The voters only have themselves to blame. The democrats have already turned half the state into a third world disaster. California is a state full of air conditioned McMansions, with elaborate landscape lighting everywhere — and most of their electricity comes from somewhere else… and they like to complain about those other place’s electricity generation. California likes to lecture everyone about how “at one with nature” they think they are. They have irrigation systems that would not be allowed in most parts of the world. Then they complain about water shortages. Mother nature isn’t buying California’s propaganda. Very strong winds spread the fire, the loss of jobs is enormous. I have never seen any thing like it. Air pollution will last for weeks, my home sits in the middle of it all but we where incredibly lucky. Lots of stuff will last for weeks…..but I doubt ‘air pollution’ will. The entire air mass will be different tomorrow….some fumes, ashes, etc may persist, but your onshore winds in the fall will help you alot. Mother nature WILL have her way. Just get out of her way…….and if you leave her alone, those black hillsides will be lush green in 18 months…. One thing humanity has in common….Tragedy and death comes unexpectedly to all….Race, Color, Creed, Economic Status and Political Affiliation have no bearing on those in its wake…. Build your house in an earthquake zone. Deplete the rivers with inefficient irrigation, with a disturbing amount going to water lush lawns in the middle of what is essentially a dessert. Heck, waste some extra water with lavish water fountain displays. Then act really surprised when mother nature tells you where to stick your environmental awareness. You have no idea what you’re talking about. I live in the fire zone, it’s no desert. It’s Redwood Country. So have some respect! We’re not So. Cal.